When it comes to finding and using fast, accurate data processing software, financial services firms are often in the lead. But now data integration and analytics have climbed to the top of enterprise BI priorities. And anything that enables faster, more accurate analytics gets attention. Currently, financial services firms are figuring out ways to integrate their disparate silos of data and application workflows. Solutions from MapR Technologies provide a Hadoop distribution with lots of add-ons and a homegrown file system. It’s an approach that enables enterprises to integrate networking and big data processing with their IT infrastructure and its applications. Use the streaming features of Hadoop, such as Spark Streaming or Storm to do real-time processing on events in the network. And use machine learning to help feed information back into the infrastructure to control it. Use Drill, Hive, Impala and other tools to carve out subsets of this operational data with SQL commands. Route this data into a tool such as TIBCO™ Spotfire® to explore and visualize the datasets. But what’s happening in the real world? Here’s an example of how one company puts that blistering speed and flexible architecture to work. Say “TransUnion”, and consumers around the world think, “Credit cards.” But for more than 40 years, TransUnion LLC has provided financial services to many industries– insurance, telecommunications and banking, among others. The company has worked to gather, analyze and deliver the critical information that businesses and consumers need to better manage their risk and customer relationships. TransUnion lead architect, Kevin McClowry, views big data technologies as an opportunity to add oomph to company growth. His role: build systems that enable new insights and innovative product development. McClowry chose a hybrid architecture, which combined commercial databases and a cost-effective Hadoop-based MapR platform. He knew that trends in historical data or newly acquired unstructured data sources were where much of the data’s hidden value lay. More accessible, useful data. 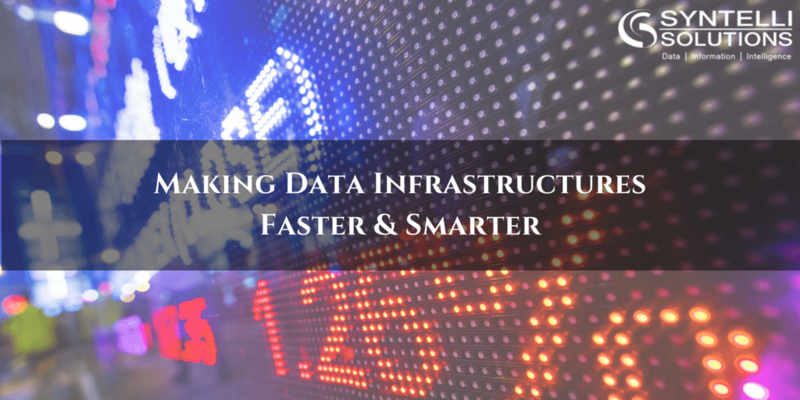 The new data processing environment included trillion-row data sets, centralized data stores and ultra-high-speed processing. Statisticians and analysts (some with deep knowledge of TransUnion data) gained deep insights by using MapR and visualization tools such as Tableau. Less data discovery and preparation time. Data analysts and statisticians spent far less time requesting, waiting for and piecing together disparate data from siloed information across the organization. Lower capex costs. The IT staff could run high-volume analytics from lower-cost storage platforms, which reduced their IT costs. Customizable analytics architecture. The flexible MapR-based architecture could be scaled to fit operations resources and requirements at each TransUnion facility worldwide. Datanami, “Leveraging Big Data to Economically Fuel Growth,” 18 November 2014, at http://www.datanami.com/2014/11/18/leveraging-big-data-economically-fuel-growth/. Syntelli is a MapR partner and our data scientists are passionate about solving your organization’s problems! Contact us today or request a demo of Syntelli Services!